We love shea butter so much as a moisturizer, we add it to 22 of our products. "The ashiness on my legs and arms vanished right away." Love, love, love Herbaria! The shea butter and lavender jojoba oil keep the chlorine from drying my skin out in the summer! "I like the unrefined over the refined shea butter because of the natural, nutty scent." 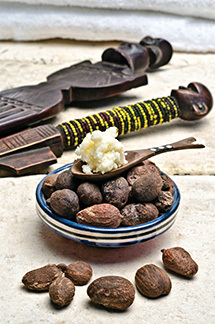 Shea butter is made from the edible nuts of the West African shea tree (Vitellaria paradoxa). For centuries, this emollient has been cherished as an anti-aging cream and moisturizing skin protector. Shea butter melts on your skin and then coats it with long-lasting protection. Use shea butter wherever your skin needs hydrating. People find this natural emollient especially nourishing and moisturizing for hands, elbows, knees, and feet. Since it absorbs slowly, you might apply shea butter at night before going to bed. If you like, cover your treated hands with gloves, your feet with socks. When you wake you’ll have the softest skin ever! Compare this pure single-ingredient body butter with popular moisturizers. Their first ingredient is usually water, which is often followed by a host of questionable chemicals including parabens, preservatives, synthetic fragrances, and thickeners. As thick and creamy as it is, you’ll be surprised to learn shea butter won’t clog pores. We’ve read it reduces the number of pimples and the inflammation of acne. Our shea butter has a shelf life of one to two years. It has no preservatives so we use a dark green jar to block out oxidizing light. If you don’t apply the shea butter regularly, keep it in the refrigerator. Let it warm at room temperature to soften again. While our Refined Shea Butter is odorless and colorless, our Unrefined Shea Butter smells slightly nutty and is beige in color. Both butters contain treasured nutrients, including vitamins A, E, F and K. The Refined Shea Butter is pure organic shea butter. Our Unrefined Shea Butter is all shea butter but not certified organic. Each jar of Shea Butter counts as 1 bar toward our free bar offer.